C.S. 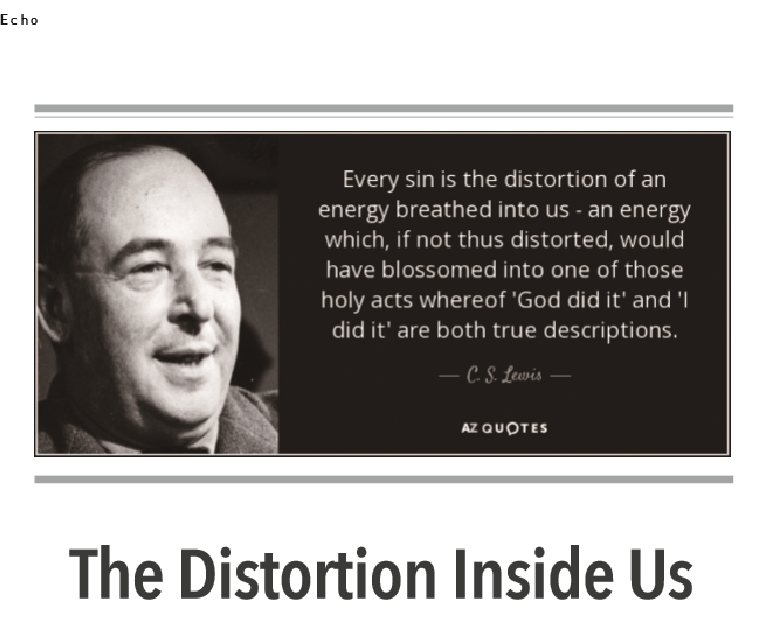 Lewis once said, “Every sin is the distortion of an energy breathed into us - an energy which, if not thus distorted, would have blossomed into one of those holy acts whereof ‘God did it’ and ‘I did it’ are both true descriptions.” He is right, every wrongdoing in life starts off from pure intentions. These intentions twist and rot as people are suspected to dangerous violence and unearthly beliefs. Eventually, these beliefs end up into a weapon that has the power to hurt not only oneself, but others as well. Though our actions might be driven by what we believe as the truth, we should always remember that they could also be just another “distortion of energy breathed into us.” We often see such kind of distortions in our daily lives. Our love for someone could easily be distorted into abusive behavior while a policy to help revive the nation’s economy could be distorted into chaos if not dealt with care. A school policy that should aid their students could turn out to be a policy that should be detered if its expenditures are not transparent while even certain cultural trends, which might have started out as a mere need for happiness and freedom could easily be distorted into reckless behavior. This is why we need time for reflection, a time where we can simply sit down and recollect our thoughts. This is the time where we have to be our own worst critics and push ourselves to understand that what we thought was true and pure, might only be its shadow.